Badri Chari BDS, MFDS RCS Edin 2010, MDS (Ortho), MOrth RCS Edin 2009, PhD Univ Manc 2009 qualified with Bachelor of Dental Surgery in 2001 from Annamalai University, Tamilnadu in India and moved to the UK in 2006. He was awarded a PhD by the University of Manchester in 2009 and, in the same year, gained his Membership in Orthodontics from the Royal College of Surgeons of Edinburgh. 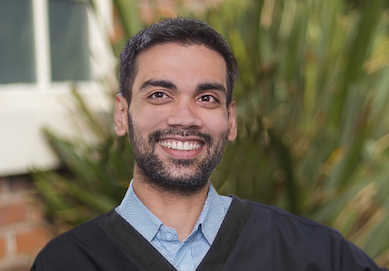 Badri is involved with teaching Orthodontics at the University of Manchester. He is also a consultant orthodontist at Stepping Hill Hospital and a Lecturer at University of Manchester Dental School. He is actively involved in orthodontic research and has many publications in prestigious orthodontic journals. Badri’s excellence has been recognized by the award of the prestigious Rising Star award in 2010 and the Chapman prize in 2011 by the British Orthodontic Society. He is an active member of the British Orthodontic Society and has been an invited speaker twice at their annual conference. He is also a member of the British Lingual Orthodontic Society and a fellow of the World Federation of Orthodontics. He is a registered Specialist in Orthodontics with the General Dental Council. In 2015, Badri was given the acclaimed David Turpin award for his research work in the field of Orthodontics. Awarded by the prestigious American Journal of Orthodontics who also published his work, Badri’s research looked at the best ways to strengthen and correct the alignment of patient’s teeth. The David L. Turpin Award for Evidence Based Research is an annual award which is given to the highest rated clinical trial or review published in the American Journal of Orthodontics during the previous year..
To relax after a busy day, Badri enjoys playing Badminton and Cricket.